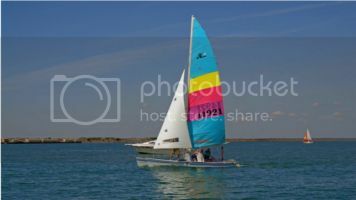 Hobie Forums • View topic - Is there a splash guard for center lace on tramp? Is there a splash guard for center lace on tramp? Post subject: Is there a splash guard for center lace on tramp? When I get my 18 really moving a good bit of water blasts up from the center lacing. It's a bit annoying when the weather isn't hot. I can pretty much stay dry till this happens. I know I could fabricate something, but am wondering if there is already something on the market for this issue? Post subject: Re: Is there a splash guard for center lace on tramp? There is, but it's not perfect, and more designed to keep the mainsheet from falling through the lacing than it is designed to keep the water out. Look for a "mainsheet overboard preventer," they make them in mesh and in vinyl. They're overpriced for what they are imo, however, so I usually just make my own out of some window screen mesh (though of course that won't keep water down significantly). 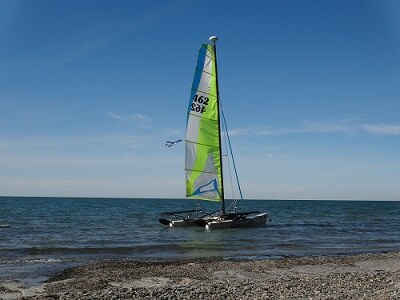 However, staying dry on a Hobie 18 seems like one heck of a feat, unless the lake is pretty calm. 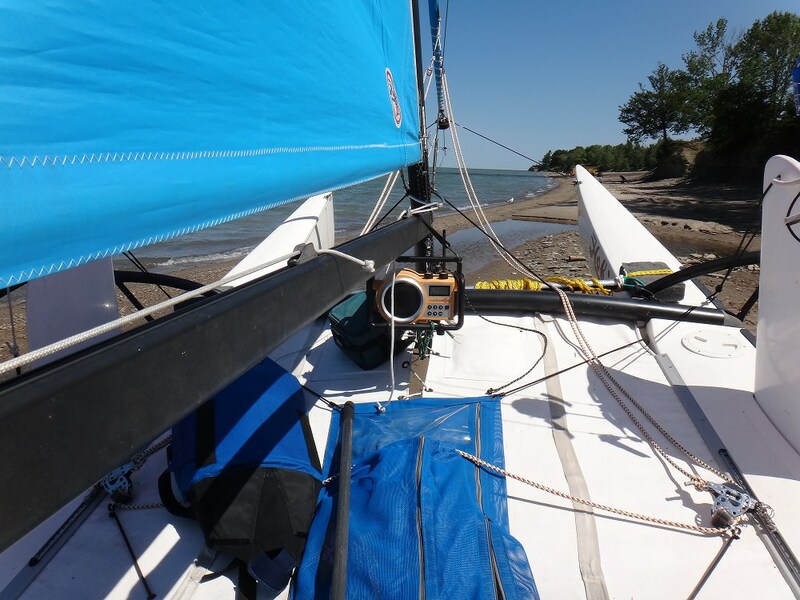 On my 17, I took a piece of vinyl siding about two feet long and trimmed it to fit between the center laces at the back end of the tramp to keep the mainsheet from falling through. It is held in place with a zip tie around the tramp lacing. Cheap and easy. You could probably do something similar along the full length of the center of the tramp to act as a spray preventer. There was an error in the costs that drove the price up. That was corrected this year, so the overboard kit is not much less expensive. This Hobie trampoline storage bag will limit the splashing and provide excellent storage. My Murrays full harness fits nicely in the bag. The bag is not in the way while sailing.